Charcoal masks have become quite popular in last few years and many brands have included them in their range. We have shared our opinion on benefits and uses of Charcoal products before and have also reviewed Freeman charcoal exfoliating mask, L'Oreal charcoal mud mask and Sephora charcoal micellar cleansing water and exfoliating wipes. With all different charcoal products, peel off mask is being raved for its quick results recently. I decided to try it for my self and today i am going to share my thoughts on Rivaj UK Black Peel Off Mask Collagen with Charcoal. 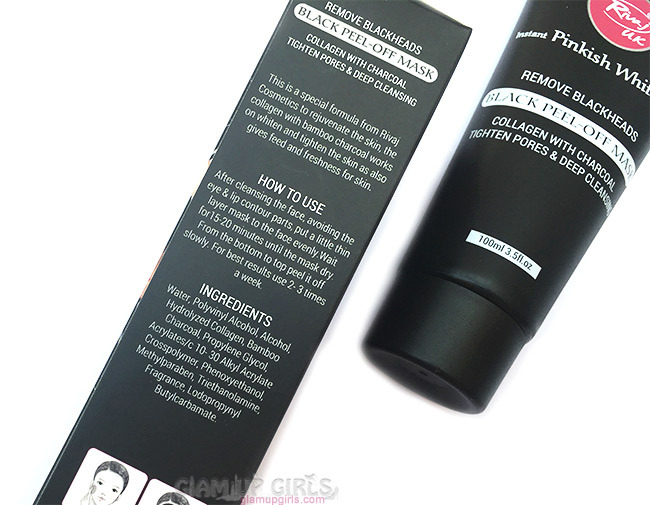 Rivaj Instant Pinkish White Glow charcoal peel off mask remove black heads, tighten pores and works as deep cleanser. This mask comes in black squeezable tube with white spatula to spread product on skin. The box have all necessary information labeled on it, including ingredients, cautions and how to use it. The sticky gel like product is similar to any peel off mask and is easy to apply with spatula. The smell of this product is noticeable but not strong or bothering and fades after few minutes. It is better to avoid applying near eyes to avoid any stinging feeling. Even it is charcoal mask but it is not warming type like Freeman charcoal brightening mask nor did i feel any irritation while application. However it does caution you to do patch test if you have sensitive skin as you might feel any itching or stinging. I apply this mask after cleansing with spatula and spread it in thin layer avoiding eye and lip area. Leave it for 10 to 15 minutes or until it dries on skin. I usually peel my masks from same side in which i applies but this mask suggest to peel on opposite side like starting from bottom. Peeling it off was quite difficult and it might be little pain full. As i only wanted to remove my black heads so i applied only on nose and little around for pore tightening. The idea of peeling it from whole face, pulling facial hairs, made me cringe and so i avoided it. Coming back to the results, after peeling the mask, i could see little white heads on the peeled mask which was gross and i didn't want to make others feel bad by taking picture of it. The skin feels super super soft, clean and brightened which was amazing and i was kept touching my skin again and again. However it leaves little itching feeling for some time after wards and toning or moisturizing is necessary. Now did it remove black heads? Yes it did remove them nearly 30% and almost all white heads. It is suggested to use it twice a week so after second time it improved little more. 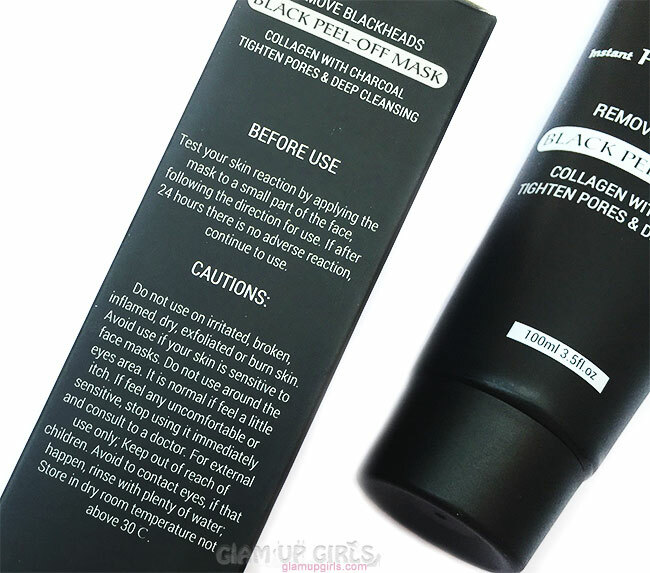 So i can say that if you have really bad case of black heads, you have to apply it about 4 to 5 times to completely remove them which is not bad considering the tube have 100ml product which will last for few weeks. The other claim about pore tightening was also met and i have seen the instant result after first use. Overall i like the product as it does provide good result with tightening open pores and removing black heads, if not instantly. I cannot say that it provides pinkish glow as i did not applied on whole face but it did clean and make skin soft and smooth where i applied. The peeling part is little hard but you have to bear little pain for good results. right?